Also known as Pulau Serangoon, Coney Island reopened in October. If you’re looking to escape the hustle and bustle of the city and reconnect with nature – and maybe play a game of ‘spot the cow’ – then this is the place to be. Try to book a free guided tour on the NParks website if you want to see a few hidden spots, including the former mansion of the Haw Par brothers. Opened in April, the uniquely shaped museum is home to 2,000 specimens of South-East Asian plants and animals, which are spread across two floors and 15 zones. The highlight, though, has got to be the three 150-million-year-old dinosaur fossils. With a glowing glass façade inspired by stepwells that are commonly found in South Asia, the Indian Heritage Centre has a wealth of artefacts that are dotted around five galleries. They document and explore the history and culture of Indians, especially in relation to Singapore, all the way from the 1st century to the present day. The opening of The Karting Arena may have been delayed by a few months, but we’re glad it’s finally here. It’s the first place in town to boast a fleet of electric go-karts, which means they produce little noise and no fumes. These can still reach speeds of 30 to 50km/h, though, just like their gasoline-powered brothers. The kid-friendly Puss in Boots suspended roller coaster doesn’t go any faster than 36km/h, so little ones can go get in on the action, too. The journey follows the fearless feline as he searches for golden eggs to save an orphanage from closing down. For older tykes, though, we’re thrilled that the Battlestar Galactica reopened after a two-year closure. If you’re looking for a place to let the kids go wild, this is it. The main court features more than 30 interconnected trampolines, and there’s also a whole bunch of other activities for bouncy fun times, including ‘slam dunk’, ‘wall run’, and, for daredevils, ‘free fall’. Finding it difficult to get into the Christmas mood under the unrelenting heat? Fret not, as 20 skilled ice sculptors from China’s Harbin International Ice Lantern Art Association have been working hard since September to bring you a magical winter wonderland just in time for the festive season. Welcome to a winter wonderland. And yes, it’s bloody freezing! Image courtesy of Century Ice Wonderland. 27 Nov 2013: Finding it difficult to get into the Christmas mood under the unrelenting heat? Fret not, as 20 skilled ice sculptors from China’s Harbin International Ice Lantern Art Association have been working hard since September to bring you a magical winter wonderland just in time for the festive season. Taking place at a speciallybuilt, thermal-insulated hall next to MBS that sprawls over 4671 sqm – that’s slightly larger than an NFL football field – visitors to the inaugural 2 Degree Ice Art exhibition can experience a blast of winter, as the whole complex will be kept at a chilly -15˚C until May so the pieces stay intact (at a cost of $3.5 million). 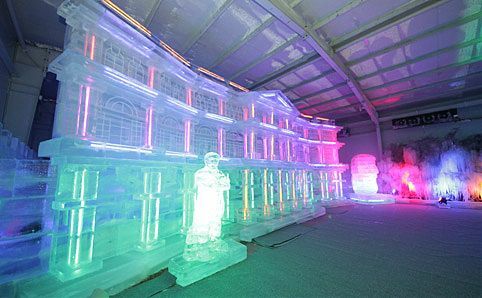 Nearly 450 tonnes of ice was used to create 36 coloured ice sculptures, including those of various landmarks such as Big Ben, the Colosseum and even our very own Merlion, plus two pretty impressive slides for kids. Aside from the exhibition, there’s a free ice bar that uses mugs made from ice – the drinks themselves are poured in the bar outside, so the liquid doesn’t freeze (bonus: when you’re done with your drink, you’re invited to smash your glass against a target board). Be sure to wear winter clothes – we strongly advice against wearing shorts, flip-flops or open-toed shoes (trust us, your feet will get really cold). There are also coats for rent at the exhibition for $5 (or if you’re just popping into the ice bar, you can borrow one for free). Bring on the ice! Legoland Malaysia Water Park is officially opening its doors on 21 October. Featuring over 70 Lego models and 20 water-based rides – including the signature attractions Joker Soaker, Wave Pool and Build-A-Raft River – this is set to be the largest Legoland Water Park in the world. Gwen Pew goes and checks it out. Legoland Malaysia’s water park is definitely kid-friendly – but there’s plenty to do for the big kids too. Photo courtesy of Legoland Malaysia. 21 Oct 2013: Legoland Malaysia Water Park is officially opening its doors on 21 October. Featuring over 70 Lego models and 20 water-based rides – including the signature attractions Joker Soaker, Wave Pool and Build-A-Raft River – this is set to be the largest Legoland Water Park in the world. Most of the slides and pools are suitable for kids as young as two, but older kids and adults will also have fun at the more thrilling ones such as the Tidal Tube, which you shoot down in almost total darkness and reach breathtaking speeds before emerging from the other side, 240-feet down. Alternatively, the LEGO Slide Racers is also designed for daredevils, as six people race down different tubes at the same time on a mat, head first. The only things to note are that firstly, grounds are extremely slippery so do be careful, and secondly, because Malaysia is predominantly a Muslim country, most people there are dressed in long-sleeved shirts and trousers; feel free to wear a swimsuit but there weren’t a lot of people in bikinis when we went for a media preview, so ladies, be prepared to stand out a little if you choose to show more flesh. Overall, though, the Water Park makes for a fun day out for all the family – so get ready, set, soak! Legoland Malaysia 7 Jln Legoland, Bandar Medini, Nusajaya, Johor, Malaysia (+60 7 597 8888, www.legoland.com.my). Sun-Tue & Thu-Fri 10am-6pm; Sat 10am-8pm. 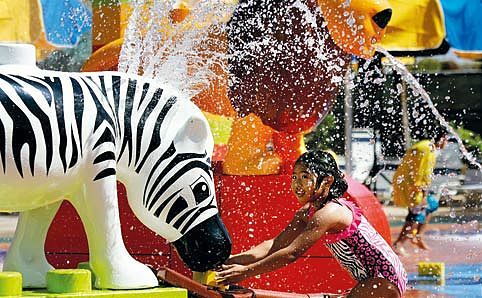 Water Park: MYR85-MYR105++ ($30-$40++); Legoland & Water Park: MYR 140-MYR175++ ($54-$67++). Bright lights along Upper Serangoon Road at 2012’s Deepavali. 8 Oct 2o13: Although we won’t get a working day off for the holiday this year (d’oh!) – due to the Hindu Advisory Board revising the official date of Deepavali from Sunday the 3rd to Saturday, 2 November – there are still plenty of ways to celebrate the Festival of Lights in Singapore. 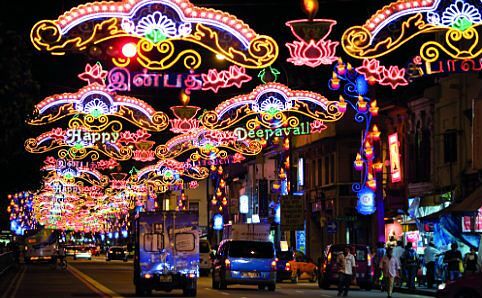 This year marks the 25th anniversary of Little India’s annual light-up, and as usual, the district’s streets – stretching from parts of Selegie Road to Serangoon Road (from the junction of Sophia Road to Lavender Street) and Race Course Road – are now adorned with colourful decorations. The theme centres on Radha and Krishna, the divine lovers in Hindu mythology, whose life-size replicas can be found swinging atop the main arch at the entrance of Serangoon Road. A range of events are planned. Following the success of previous years, the Festival Village returns to Campbell Lane and Hastings Road to offer 15,000 square feet of retail therapy. Find stalls selling all sorts of decorations, jewellery and crafts, get your hands decorated by henna tattoo artists or try delicious Indian delicacies. The Heritage & Crafts Exhibition, titled Our Indian Forefathers and Their Trades in Singapore, is at Hastings Road and showcases a range of photographs and stories. There are also workshops for participants to learn from Indian craftsmen. Kids are invited to dress up as mini Radhas and Krishnas (5 Oct, 3pm, Hastings Rd), while the Family Challenge (12 Oct, 2pm, Hastings & Kerbau Rd) encourages adults to partner up with their little ones to complete three designated tasks around the Little India district; there are prizes to be won at both events. A Dance Medley (19 Oct, 5pm, Hastings & Kerbau Rd) sees a line-up of performers demonstrating various types of traditional dances, and be sure not to miss the spectacular Theemithi, or Fire-Walking, Festival (20 Oct, 6pm, Sri Srinivasa Perumal Temple). For the best way to welcome the Festival of Lights, head down to the Event Marquee at Race Course Road. Spectators will be treated to an evening of performances by local and Indian artists – the full line-up can be viewed on the Little India website listed above – starting from 8.30pm, and culminating in the much-anticipated countdown. A fireworks display will mark the official start of Deepavali with much colour and fanfare – just be sure to head down early and leave any metallic items behind, as huge crowds are expected and security checks will be conducted. See www.littleindia.com.sg for the full schedule. GoGreen After Dark Segway Tour. Photo courtesy of GoGreen Segway Eco Adventure. 17 Dec 2012: Come the small hours, there’s more to do in Singapore than just clubbing and drinking. Gwen Pew and Lee Min Kok test out some fun activities in the dark of the night. Yes, this is certainly one of the more mainstream tourist attractions on the island, but the Night Safari is nevertheless still a great choice for an alternative night out away from the buzzing city life. The park features nearly 140 species of animals from anoas to zebras in a mock natural environment, although admittedly it does resemble a night zoo more than a proper ‘safari’. The most popular and comfortable way to explore the 35-hectare outdoor space is by tram, which leaves every 15 minutes or so. It is accompanied by a tour guide, who gives live commentary about every species the tram drives past; the route goes through seven simulated geographical zones, including the Himalayan Foothills (which features the ram-like markhors and mouflons, and strangely, a flock of flamingos) and Asian Riverine Forest (tapirs, comical bearded pigs and the stunning elephants). For a more personal experience, however, we recommend getting off the tram and exploring any one of the four designated walking trails. Away from the main road, we were able to really open up our senses to the smells and sounds of the night – in the quiet of the jungle, we were able to hear hyenas calling to each other and watch the Malayan tiger prowling around at length. These trails cover areas that the tram does not reach (though only the tram goes through the final and longest stretch), allowing you to see animals such as the fishing cats and giant flying squirrels. The Wallaby Trail, which only opened this August 2012 and is home to a variety of Australian creatures, is especially worth checking out for their cute marsupials, venomous creepy crawlies and a beautifully lit (if humorously named) ‘Bridge of Suspense’. Sightings of animals are abundant and almost guaranteed. And seeing you’re already there, do also try to catch their Thumbuakar performance and Creatures of the Night show if you fancy ooh-ahhing over fire stunts and cute animals playing up to the crowd, respectively – both of which are surprisingly well done. 80 Mandai Lake Rd (6269 3411, www.nightsafari.com.sg). Take a taxi. Daily 7.30pm-midnight, last ticket sale at 11.15pm. $16-$39. Punggol Prawning at Marina Country Club is definitely one of the posher prawning places we’ve seen – there are three sleek-looking black prawn tubs with potted plants and matching upholstered bar stools in a cavernous covered warehouse (with towering boat racks in the background). For $17, you get a rod and a plastic dish filled with bait – a moist paste of chopped-up worms that, unfortunately, takes disgustingly long for us to properly mash/mold onto the hook. And unless you’re a veteran or have a natural feel for the technique, chances are you’ll end up like us over the next hour: sadly, between three of us, we caught one prawn – almost by accident, and certainly not by following the mimed instructions by the non-English-speaking – but earnest – attendant. From what we understand, an initial tug means a prawn has grabbed the bait with its claw – you’ll need to avoid scaring it off long enough for it to put the hook in its mouth. Of course, given our performance, we may have gotten it all wrong: all too often did we feel a tempting pull, only to reel it up with an excited yell and discover there’s nothing at the end…and reapply the bait that’s just disappeared along with our imaginary catch. Rinse and repeat. Of course, the frustrating bit is only half the challenge. As nonchalantly demonstrated by the friendly attendant, if you do catch a prawn, you’ll have to twist its claw legs off, then grab it while it’s squirming to get the hook out of its mouth – definitely not for the squeamish. Slightly unnerved by the whole thing, we didn’t even stay to roast our hard-won catch on the provided electric grill. Nevertheless, it’s still an apparently popular activity (inexplicably, more popular the later it gets – several experienced groups rolled in towards the end of our session just before midnight and immediately began pulling up prawn after prawn) – and something that you’ll be happy to say you’ve tried at least once. Most prawning spots are open round the clock; Marina Country Club provides a free and punctual shuttle service direct from Sengkang MRT at regular intervals (see website for timetable). Marina Country Club, 600 Punggol 17th Ave (8696 6704, www.facebook.com/ebijpunggolprawning). Sun-Thu 9am-1am; Fri-Sat 9am-4am. Freshwater prawning: $18/one hour, $28/two hours, $33/three hours. Saltwater prawning: $20/one hour, $30/two hours, $35/three hours. For a slice of forgotten Singapore history and the low-down on urban legends, Charles Goh is your man. The co-founder of Asian Paranormal Investigators (API) is known for his spooky tours after dark, but don’t go expecting ghouls, pontianaks (a female vampire in Malay folklore) or an actual supernatural experience – it’s more of a three- to four-hour nighttime trek with a history lesson thrown in for good measure; but more often than not, the stories themselves are creepy enough. Tours are arranged directly with Goh in advance (two weeks is recommended, as Goh has another full-time job; this is essentially a hobby of his) – they can be customised based on where you want to go, with popular spooky destinations such as Old Changi Hospital, Loyang Red House, Pasir Ris Swamp, Marsiling tunnel and Seah Im Road’s hidden World War II bunker. We headed out to Dead Man Village, located in the legendary Bukit Brown cemetery (which will change significantly due to the plans for a highway bridge to be built there). Formerly a community of 20 families who tended the graves (including some of Singapore’s most famous Chinese pioneers) throughout the 213-hectare rainforest, the village is now near-abandoned. Throughout the tour, Goh keeps up a steady stream of commentary as we tread gingerly through a forested path in total darkness to our destination. There are a couple of hair-prickling moments as we stumble across old tombs – some dating as far back as 1833 – and an outdoor toilet made of concrete next to a hut with a Sadako-like mirror hanging by the door. But just as fascinating are Goh’s fun facts, which gives context to everything on the tour. Various locations, regular pick-up point at Newton Food Centre (9878 8869, www.api.sg). 7pm; day and late night tours available on request. Up to $45 per person, minimum two people. * The API Spooky Tour section was written by Lee Min Kok.